Rooms were clean and spacious. Indian restaurant served great food. Staff extremely helpful. Shower in the room was excellent. We have been to this place A LOT of times over the years, for occasions such as our anniversary and birthdays etc. as its nice, local and a lovely stay. However this stay will be our last. Breakfast was very good. My room was quite small for the price. The bar charges extortionate, nearly £16 for two glasses of spanish house wine , disgusting. Reasonable price. 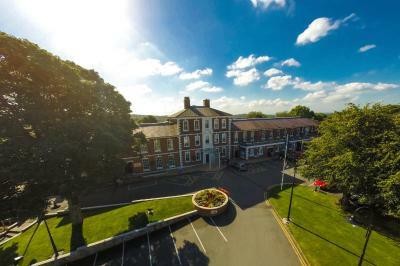 Nice building and location and the staff got me checked in quickly and with no hassle. Tim and Emma on reception were really friendly and helpful. 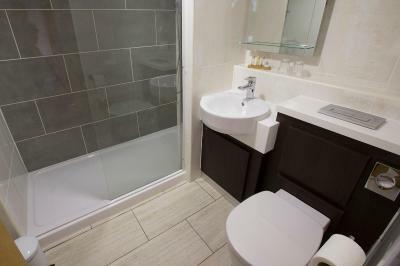 Stylish property, large rooms and comfortable. 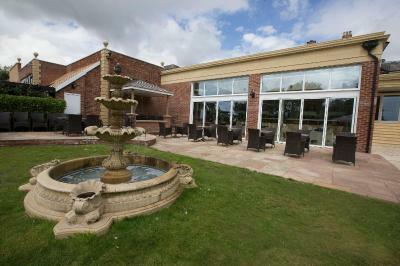 Great health and spa club, 3 eating choices on site. All in all great hotel. Really enjoyed my stay here. 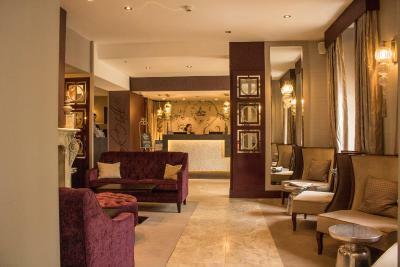 1 night leisure and 3 nights of a business stay. 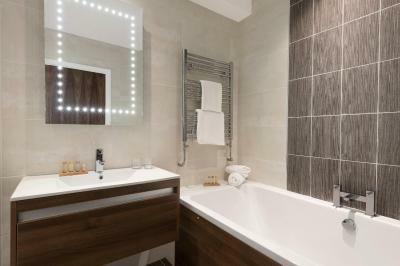 Large spacious room… Incredible bathroom… Friendly service… Tina at the bar was amazing! 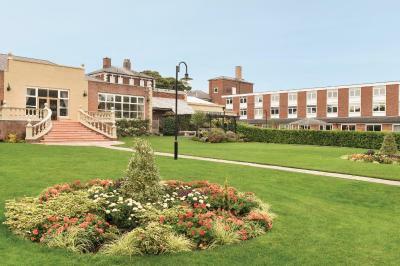 Set in lovely grounds and a good distance from Wolverhampton city centre. Comfortable beds and good sized bathrooms. 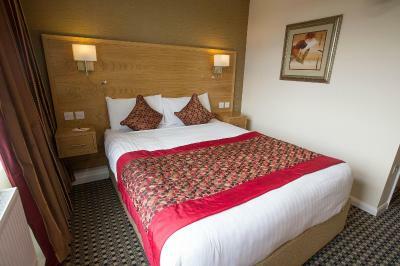 Ramada Park Hall Hotel and Spa Wolverhampton This rating is a reflection of how the property compares to the industry standard when it comes to price, facilities and services available. It's based on a self-evaluation by the property. Use this rating to help choose your stay! 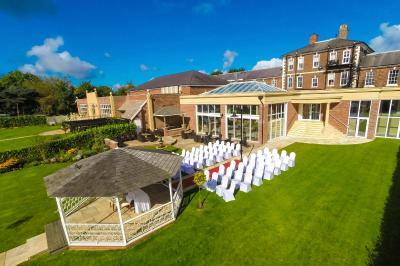 In 5 acres of peaceful grounds, 3 miles from Wolverhampton city center, this beautifully preserved Georgian mansion offers free parking and superb leisure facilities, including an indoor pool. 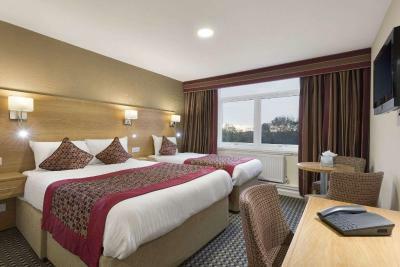 The Ramada Park Hall Hotel and Spa Wolverhampton has a fabulous on-site health club and spa, with an indoor heated swimming pool, a sauna, a steam room, a hot tub, and a fully equipped gym with cardiovascular equipment. 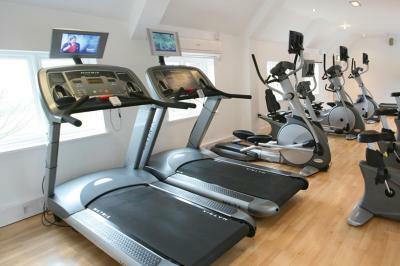 The wellness center includes a hair and nail salon, alongside beauty treatment rooms offering facials and body massages. 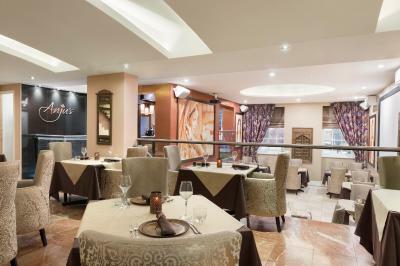 There is a bar and terrace area, as well as 2 great restaurants. 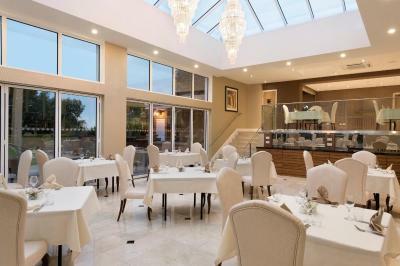 Anjus Indian Restaurant offers a contemporary Indian-fusion menu and The Orangery Restaurant offers traditional English dishes and popular Mediterranean options. 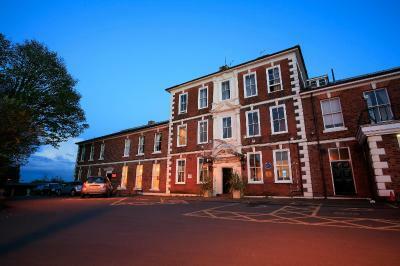 Inside the hotel’s carefully preserved, grade II listed exterior, the rooms are stylish and contemporary with a relaxing feel. 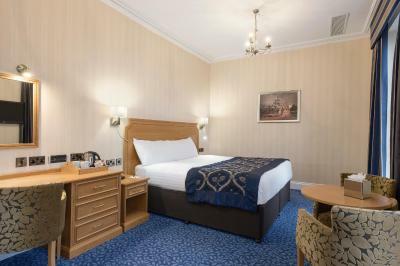 The World Heritage site at Ironbridge, Birmingham, Cadbury World and the Black Country Living Museum are all within 30 minutes drive of the hotel. When would you like to stay at Ramada Park Hall Hotel and Spa Wolverhampton? 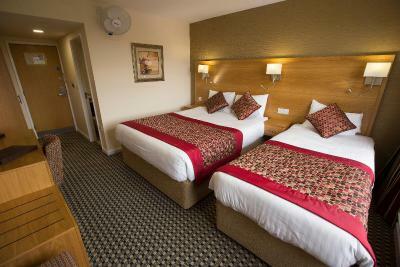 This double room comes with 1 double and 1 single bed as well as air conditioning. 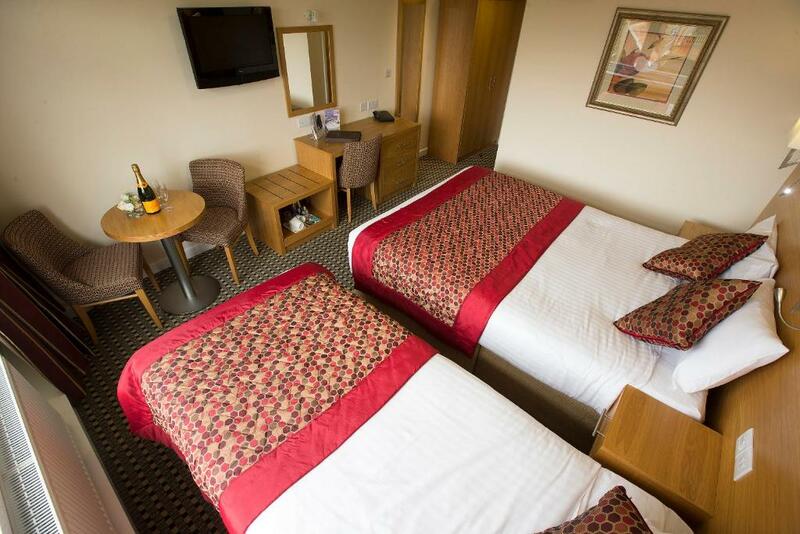 This double room has 1 double bed. This room can only accommodate 1 or 2 adults. Please note that air-conditioning is not provided in this room. This suite room comes with 1 king size bed and a sofa bed. 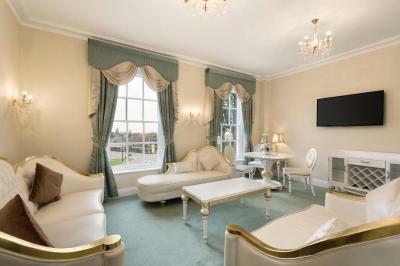 This room can only accommodate up to 2 adults and 2 children up to the age of 12 on a sofa bed. 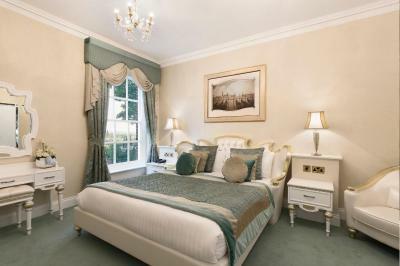 This executive room has 1 double bed. 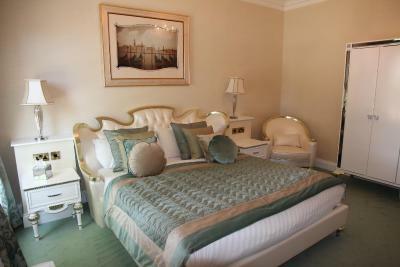 This suite has a king size bed, microwave, air conditioning and tea/coffee maker. This twin room features 2 single beds, a cable TV, air conditioning and tea/coffee maker. 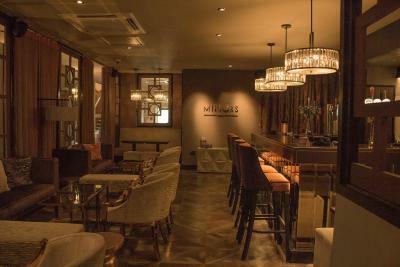 In a warm and welcoming atmosphere, we mix the old with the new; merging traditional style with contemporary features. 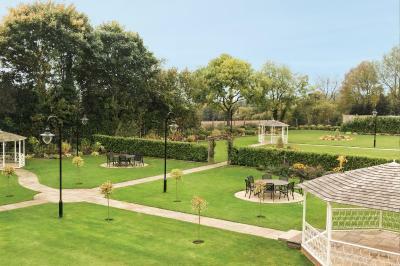 The leafy surrounds and wonderful views offer the perfect setting for weddings and other family celebrations, while our location makes us an ideal base for business travellers and for exploring the attractions of the local area. 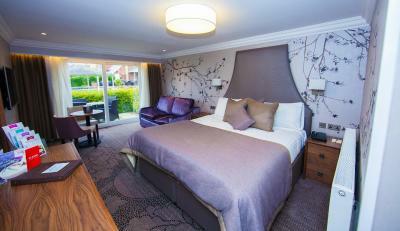 House Rules Ramada Park Hall Hotel and Spa Wolverhampton takes special requests – add in the next step! 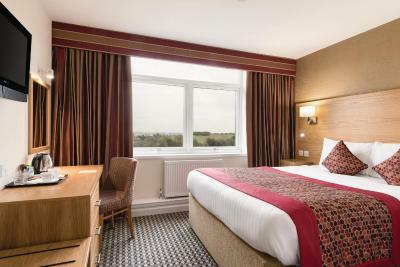 Ramada Park Hall Hotel and Spa Wolverhampton accepts these cards and reserves the right to temporarily hold an amount prior to arrival. 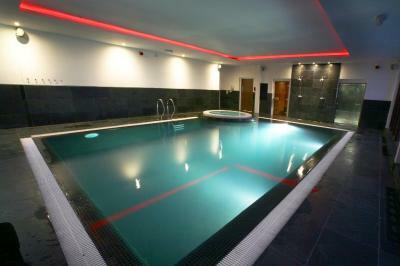 Please be aware that the health club and spa is for adults only and this includes the pool area. Due to safety reasons, children under 18 years are not permitted to use the pool at any time. However, there are 2 modern leisure centers within 5 miles where children are welcome. For more information, please ask staff members. No more than 2 adults will be permitted into a family room. Please note that the swimming pool, steam room, hot tub and sauna are not available until 2018-05-25 due to ongoing emergency maintenance work. Bar tiny - nowhere to sit to have bar food. We had to ask to find somewhere to sit. 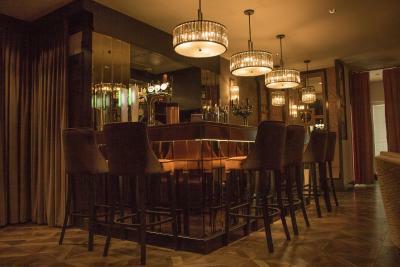 Only one person serving at the bar meant very long waits as there was a wedding party there who were monopolising him. 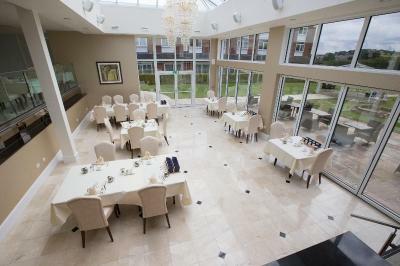 We moved to the Orangery, but were told to go to the bar to order the food. When at the bar the barman asked wasn't the girl in the orangery serving us. We ordered food and sat in relative peace for about 20 mins before a rowdy party came in, so we gave up and went to bed. Once in bed a party started in the room next door. Despite repeated calls to reception, where eventually they stopped answering me, I had to get up, get dressed and walk down to reception (there are no lifts and I have a disability). Reception eventually sent someone up an hour after my first complaint. They told him they weren't being noisy and off he went. They quietened down for about 10 mins then started slamming doors and yelling again. They moved down the corridor to another room where they continued all night. In the morning another guest complained and I backed him up. I was told 2 complaints and they are removed from the hotel. But I made numerous complaints and they were still there. The first night was rudely awoken at 4am by another rowdy party slamming doors and yelling. Two very disturbed nights sleep and a long drive after was not fun. Breakfast was OK but expensive and I was told on arrival I'd not ordered breakfast. I had. I was told I would be given complimentary breakfast which never happened. I was still charged for it though given 20% off for the noisy night. It is a Ramada! 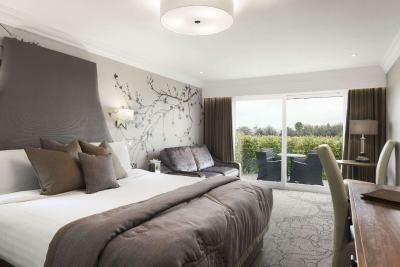 If it was Premier Inn I'd have had both nights gifted because they guarantee a nights sleep and if you don't get it you get the room for free. It's meant to be a better class of hotel than a Travelodge or premier inn but it really felt as bad as Travelodge. Location was nice. Pretty views. I can’t say there was anything I didn’t like ..
Everything was bad,the room and the the silent is a dream there. Everything was lovely. Bed wasn’t too comfortable and swimming pool was only for over 18’s so kids could not use it. Showers in both rooms either had no pressure or scalding hot. No TV remote in one room. Breakfast not very good and either half cooked or over cooked. Also coffee machine playing up. It’s a shame that hotel. Child guests could not use the pool whatsoever as this was why we booked the hotel. Only 1 pillow on the bed, noisy row from 1am until 3 am kept us awake. Still haven't had the pre-authorisation back into my account. Great bar, and great location. The mattress in our room wasn’t good. Poor quality. Initially I wondered why it was on the outskirts of the city, but then it is a nice and quiet are so not that inconvenient at all! Nice comfy room, good choice for breakfast would visit again. With the exception of the reception staff, the staff didn't seem to know what was happening at all! The rooms appeared to be clean, but were in need of repair. We couldn't turn the heating up and the room was freezing, there were not enough pillows either. Everywhere looks like it needs a good clean or decorate. The toilets were wobbly (at the ballroom) and the disabled toilet has no emergency pull cord which is a worry as a disabled person. The bed was quite comfortable, but the lack of pillows let it down. The wedding and party was extremely loud, which was awful trying to get our little girl to sleep. Friday night was really noisy with people running about and being loud. We stayed over a weekend when the hotel was crazily busy. I was at a conference through the day on Saturday, then there was also a large wedding, and large birthday parties in the hotel and restaurant. 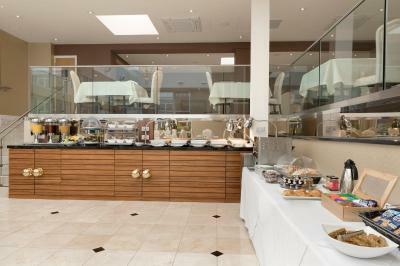 The reception staff were fantastic and so helpful despite being rushed off their feet. 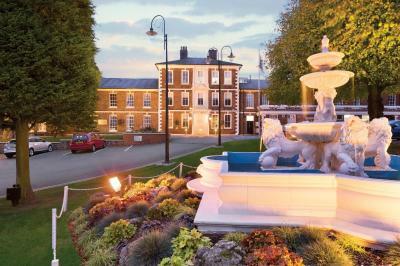 The hotel itself looks stunning from the outside, and the ballroom where our conference was is beautiful.